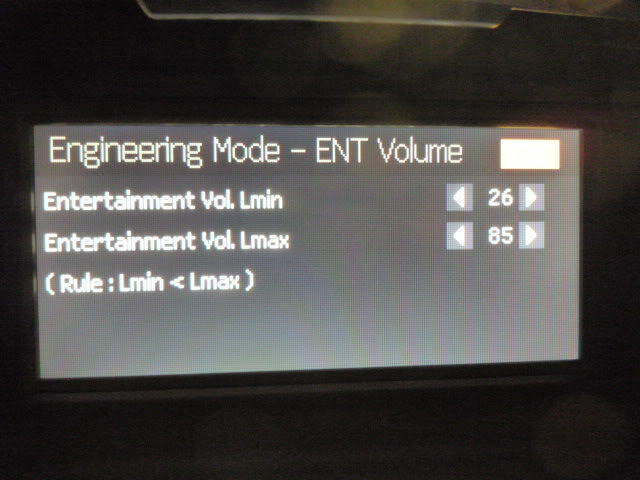 Everyone is totally misunderstanding the ent volume menu. It is the setting.that determines what range the volume is allowed to be at when you start the car. For instance if I set the lmin setting to 59, turn my stereo down so I can barely hear it and then shut the car off it will be blaring when I turn it back on. 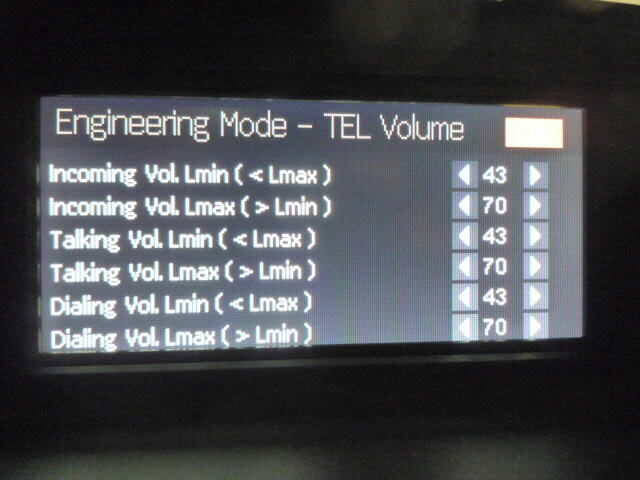 (Turns itself up to 59%) the lmax is 85% max as to not blow the speakers on startup. 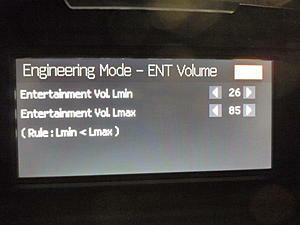 I have min set to 15 max 59 so no matter what when I sta,rt the car the.volume is below a ear exploding level. I can still crank the volume like normal after that. Maximum output remains the same no matter what. 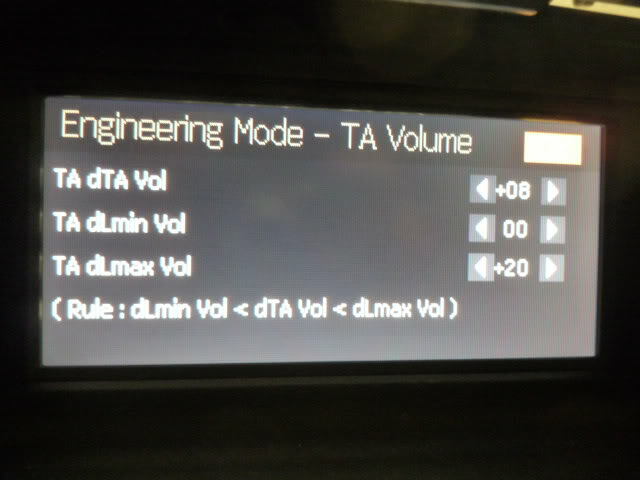 This setting is just startup allowable volume range. I just bought a 2009 C300, I've had it for under a week and I'm still getting used to all the gadgets that come with it. Can someone tell me if there's a fix to boost the AUX volume? I have a Zune, not an iPod, and when I finally figured out how to change to the AUX setting, the only 2 options showing on the screen are AUX and SOUND. If I press AUX, it only shows the option of "go back to disc" and if I press SOUND, it brings me to a menu where I can only change the bass, treble and balance of the audio. Unless I;m completely missing something because I'm new to MB, I'm stating to think that my only solution is to buy an external volume amplifier. Any help would be great appreciate it, thank you so much! P.S. Bill-how's your Spanish? Yo creci en Nueva Rosita, Coahuila. Saludos! @sciencex5 - "Por supuesto esta muy bien mi español" Since MY2010 (fabrication dates from mid-2009) there was a software change for the Audio20 which included a Boost of about 6dB, or 4 times the voltage. I am not sure if the equalizer was also added in this update. There are threads of people paying $1200 at their MB service just for this software update, in one case the dealer was unable to successfully complete the update on a 2008 C350. Happily the owner drove off with a new 2012 C350 Coupe. Point being that it may not be possible to reprogram (this Boost is all digital of course) the Audio20 to get the AUX volume to a level equal to the Radio/CD. Solutions: hopefully the dealer can show you or even temporarily plug-in a MI Plus and see if that provides the proper gain for your Zune. I am not sure if you get all the benefits of function and tune selection you do with the iPod via the Media Knob. 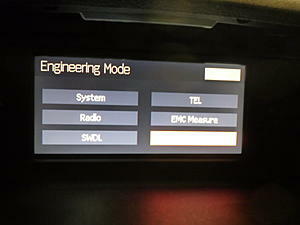 The cost may be the same, and the display and map advantages for those with the non-COMAND systems are fantastic. Below, a pix of the screen showing Aux-Boost-Sound on the 2010 Audio20 update. Y que haces en Acapulco? Te retiraste y compraste una casa barata alla? So what I'll probably do is try one of those cheap Cmoy amplifier things, if it can at least amplify the volume a bit without distorting the quality too much, that would be just fine. Por cierto, wtf is a MI plus? Disculpa mi ignorancia. If you find that you need a preamp, there are plenty of options. It doesn't use batteries or any plugin power. Sound Shocker's moto is "The Pure Sound of Glass". Right. No scientist could accept that there is a 12dB gain (thats 16 times the voltage required to achieve the "4 times louder" claim) without some other kind of power requirement. The website offers no proof of their product's performance, measurements with a voltmeter or oscilloscope, to document this outrageous claim. We should all do a group-buy and ask PHP Audio to make a chip that boosts the W204's HP four times, and with no extra fuel consumption besides!!!! Everyone would love a 912 HP C300 that gets 26MPG on the highway. This is exactly what PHP Audio claims. Acapulco Bill - I’m Pete Palmer (PHP Audio) and just saw your post (thank you Google Alerts). I hope it’s OK with the moderators for me to shed some light on this subject. Sound Shocker is NOT magic. It’s basically a pair of audio transformers in a box (much like microphone impedance matchers). We are talking “state of the art” 1930’s technology. Since the headphone output is expecting a low impedance (headphones range from 32 – 600 ohms) and the AUX input is a high impedance (typically 10K – 47K ohms) you can use a transformer to impedance match the two devices. With the transformers in place, the load on the headphone output appears to be a pair of 100 – 150 ohm headphones. This means that you can use transformers with a voltage gain of about 10:1 which is +20dB. Because of the way we perceive sound it takes +10dB to double the volume and so +20dB is perceived as 4x louder. Can the same voltage gain be accomplished with integrated circuits and batteries or an external power source? Absolutely! So why do I do it this way and no one else? I wanted to offer what I felt was the best and most convenient solution. No Batteries, No Plug-in Power, No ON/OFF switch etc. Quality audio transformers are just too expensive for most companies to even consider using them in such a product. As for “The pure sound of glass.” It comes from the (glass) vacuum tube amplifiers that I design and sell on a custom / semi-custom basis. If only I could, that really would be great. But the car and oil companies would hunt me down and I’d probably disappear off the face of the earth. I have a 2008 as well and the menu options are different. 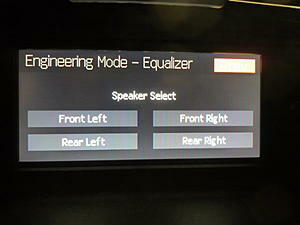 There is no "Boost" selection, but a host of sound options. I apologize about the poor quality photos, they were taken from my phone. 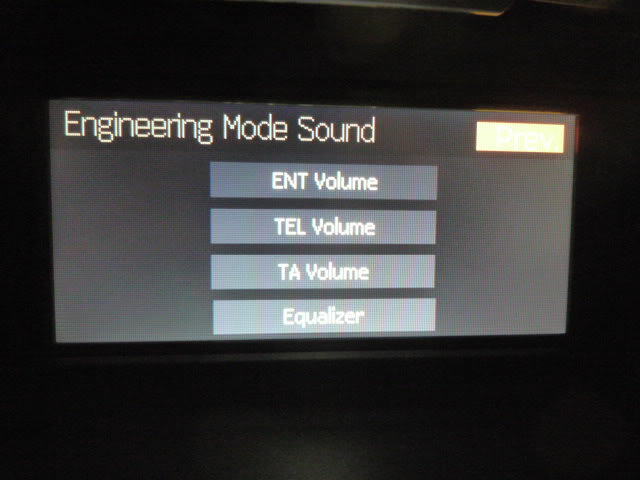 I am not sure what settings to change to get the "Boost" adjustment equivilent on newer models. The 2008 W204 Audio20 has no provision for the Boost, even with a software upgrade which enabled this feature for 2009 models. 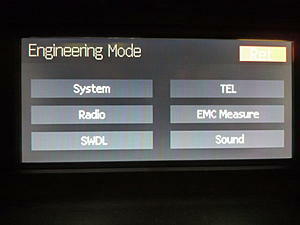 The 2010 W204s with Audio20 headunits already have the Boost capability and the updated software installed. By the way the photos are very good. Hope you purchase a "Sound Shocker" as a solution. A little tip about something I just did....I engaged the high pass filter (this rolls off the bottom end). I set it to 60 hz, with a slope of 12. My system (standard audio 20) sounded bloated, even with the standard bass adjustment turned quite a bit down. It decreased the "bloat", but also losses the frequencies in the 70-90hz region, which is where the solid chest hit thumps are most present. I wanted to get rid of the ultra low end stuff, which only stresses the amp and speakers. Granted, if you have proper amplification and large speakers/drivers, the ultra low end stuff is good, because the system can properly execute all the frequencies. I basically took a little stress off the system, but maintained a solid, full sound. I didn't want to mess with the parametric EQ, because a roll off/hpf is exactly what I wanted/needed. The system otherwise is decently tuned by default, it just doesn't have the abilities to reproduce the lowest of frequencies. I just helped it not have to "worry" about anything below 60hz. Even a 40hz HPF would help a little, and trust me, you're not missing anything at or below this with the stock system. Is there a volume increase option for a 2006 CLS500?